Each year aerospace suppliers, manufacturers, and airlines come together at the Aircraft Interiors Expo Americas to showcase new materials and designs, network and create lasting partnerships for the future. 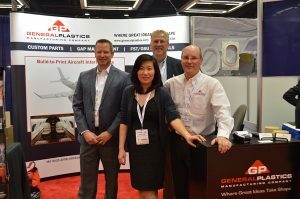 At this year’s show, the General Plastics team successfully made new industry connections, from OEMs to Tier I and II companies around the world. We also reconnected with old friends and customers, using this opportunity to talk about ongoing projects. Joining sales and marketing at the show were members of our quality assurance team. “Giving employees from different departments the opportunity to talk face-to-face with customers aligns everyone in the company and generates the knowledge to push us forward,” Director of Sales Brian Sweeney said. A product we were excited to showcase at this year’s show was the FR-3800 FST, the industry’s first halogen-free, polyurethane-based foam that meets fire, smoke and toxicity (FST) regulations as well as Ohio State University (OSU) heat-release standards. Sweeney and the team brought samples to the show so attendees and other exhibitors could interact first-hand with the foam. 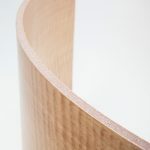 This helped them understand the product’s properties and how it might fit into their products and processes. And the verdict? As Sweeney explained, “People have been trying to make foams like this for years because it’s something the industry really needs. We’re generating awareness and working on projects to show how effective it is in performing as intended. It’s becoming necessary to have material like polyurethane foam pass all safety standards to be used in core applications.” The FR-3800 FST is an excellent and well-priced product that will allow for building lighter, safer aircrafts. Zhou added that testing new materials is an integral step in the manufacturing industry that entails some investment, but experiencing problems on an untested product and fixing them later can be even more costly. Strict fire safety standards are foundational to the entire aerospace industry, and we bring this knowledge to bear when we attend aerospace tradeshows like the Aircraft Interiors Expo. General Plastics has been serving the aerospace industry for over 60 years, now pushing over 2,000 fly-away parts. We will have a part on just about every plane you see. Our relationship with the aerospace industry is one of our strengths and part of our legacy, and it’s a relationship we value. We keep the individuals that will build and board these aircrafts at the forefront of our minds when we expand our capabilities, and create and deliver products to help make aircrafts continually safer and more comfortable. Contact us, to learn more about our FST/OSU compliant polyurethane foam and services.